The first sequel to 1985's beloved Back To The Future time travel adventure comedy, Part II offers plenty of amusing time hopping but lacks focus and suffers from middle chapter syndrome. After returning from 1955 to 1985 at the end of the first film's events, eccentric inventor Emmett "Doc" Brown (Christopher Lloyd) immediately whisks teenager Marty McFly (Michael J. Fox) and his girlfriend Jennifer (Elisabeth Shue) off in the DeLorean time machine to 2015. 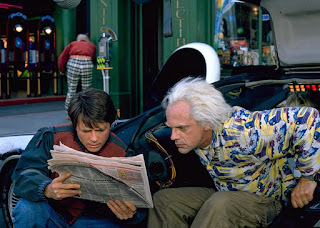 Doc needs Marty to intervene and prevent Marty's son Jr. (also Fox) from getting involved in illegal activity with Biff's grandson Griff (Thomas F. Wilson plays both Biff and Griff). Marty does prevent Jr. from getting into trouble, but in the process realizes that Marty grew up to be a weak man due to his inability to walk away from an insult. Worse still, in 2015 the elderly Biff gets his hands on an almanac covering the score of every sports event from 1950 to 2000. He steals the DeLorean, travels back in time and passes the knowledge to the young Biff. 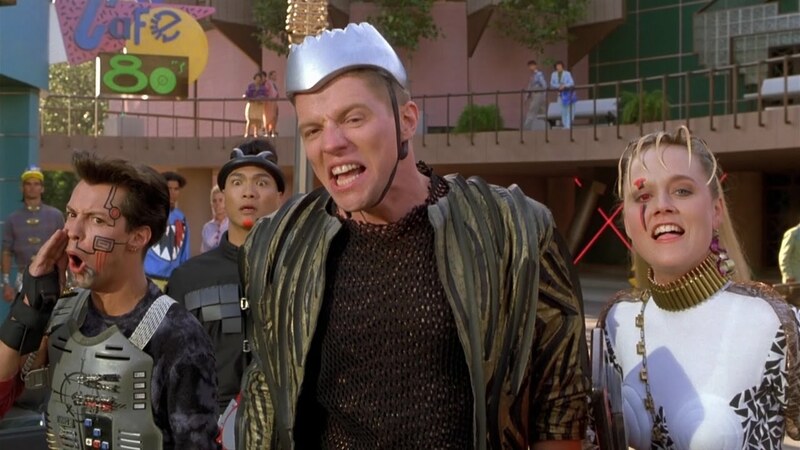 When Doc and Marty arrive back in 1985, they find a hell-on-earth created by a mega-rich and all-powerful Biff. Doc and Marty have to again travel to 1955 to prevent the almanac from falling into young Biff's hands. Directed by Robert Zemeckis and executive produced by Steven Spielberg, Part II is more manic than cerebral. 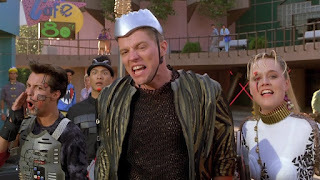 The film undoubtedly enjoys a high amount of madcap energy, and has fun imagining the future in 2015 and an alternate present in 1985, warped by Biff's evil. But this segment of the story is very much a bridge from the original episode to the trilogy's conclusion, and there is no hiding the sense of sideways drift. Other than the imaginative portrayal of Hill Valley in 2015, the entire future-set sequence appears half-baked, leaving a lot more questions than answers as Doc and Marty quickly abandon the future and zip back first to 1985 and then 1955. The women in the story also suffer from neglect. Jennifer appears set to join the adventure before being summarily knocked-out for the duration, and mom Lorraine (Lea Thompson) is reduced to a caricature in a distasteful portrayal of the McFlys in 2015. And the central quest to retrieve a sports almanac is fundamentally not that interesting, this chapter reduced to a classic McGuffin set-up devoid of human-centred emotion and compelling drama. Still, there is enough adventure and imagination in the film to maintain interest, thanks in large part to Michael J. Fox and Christopher Lloyd reprising their roles and fine-tuning their unlikely duo dynamics. The gutsy teenager and wacky inventor are a formidable team, and convey a sense of problem solving ingenuity that powers over the bumpy aspects of the script. Back To The Future Part II is a necessary elaboration, in itself an incomplete and vaguely unsatisfying work but nevertheless part of a lively journey.